Where is my past? * It’s gone. Now, stealth: noun – cautious and surreptitious action or movement: the silence and stealth of a hungry cat | why did you slip away by stealth like this? The surfer above is obviously accomplished. The spot that he is surfing, is shallow and the wave has some punch. With a wrong move there could be trouble. I move to spots where the wave is more mellow. More do-able for me. When this shot was taken there were four guys on this particular break. Four or five blocks down was the second crowd, riding less threatening waves. And that trend carries on down, to the waves where there are women and children. And I realize I paint that with a broad brush, knowing there are women and groms out riding challenging surf. The point I am making is, when I am surfing, knowing I am not hungry and cat like, for, or on waves ~ and I’m on some break, where it gets over-run by people, that want to dominate and beat their chest. While I try to surf, I picture the waves I think I would want to surf on, if I was a guy – I dang sure wouldn’t want to be trying to dominate the bottom level surf area….that would just be too sad..
It’s a better world when I surf. I paddled out yesterday for the first time here in Florida. This trip anyway. Florida and Fernandina Beach is my primary home. This morning, before surfing, I was reminded of the day that came every year, when my mother would drive us out of the woods, on the Westside of Jacksonville, for our long stay at the beach. It was an annual trip, following winter. We were never allowed to get into the water before May. I was a little kid. I still have little kid ways. And I’m glad. Those memories and the feeling that I get surfing are free. There’s no debt and no interest to pay. And it’s great owning cherished memories of my mother. Surfing is the best, and really if it hadn’t been for my mother and her love of the ocean, I’m sure I wouldn never have become a surfer. By the way, my mother only had one traffic ticket in her life; a speeding ticket when when she was about sixty. She wasn’t even going that fast. She did not drive over the speed limit. It always took us a LONG time to get to the beach, but they were good road trips. 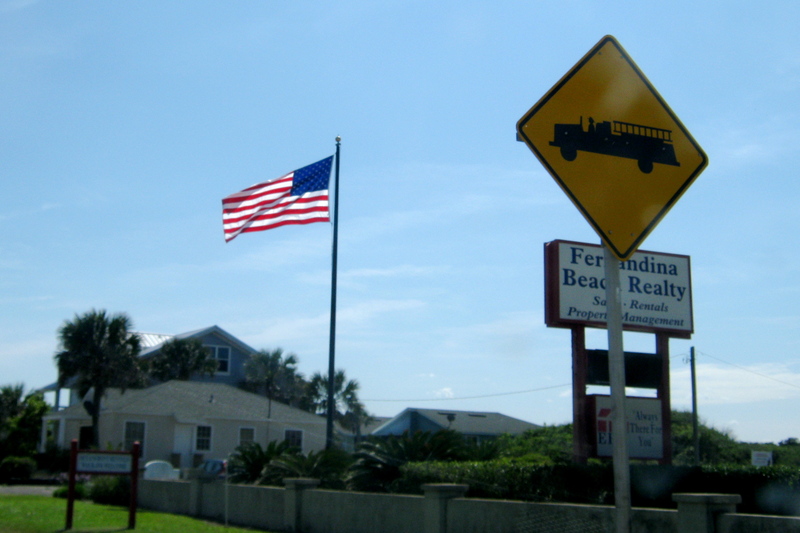 When riding on A1A we look up to the flag for our most important weather report. If it looks like this it’s a west wind. And further inspection is required. West winds make the waves clean, but unfortunately it can make them smaller, little by little. However, we have a bit of a ground swell going on, so I waited for low tide and the waves to push in. I had so much fun surfing, small chest high waves. They were breaking left, off of the sandbar built up by the local pier. It was a tough crowd to be in, because it was kids, but that’s OK, everyone starts somewhere. They obviously love to surf too. They charged some good waves. 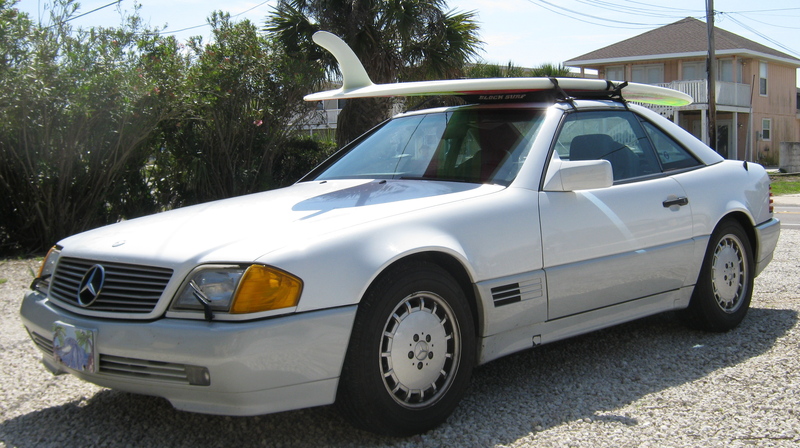 Then it was back to my surf-mobile and a ride, back to the woods. At least these days, I don’t have to go back to the Westside. Yes, it’s a better world today. We’re expecting good waves Saturday and Sunday. Historically, we always have good waves on Easter. Thank you, Jesus. P.S. One day maybe, I won’t write in my short choppy sentences, telling my story before I run out the door. Maybe one day, I will give descriptions of the water and how it really feels to be in the water and catch waves. And my words will make you feel like you’re right there with me. Creating good days today; creates good days, tomorrow. It makes happy yesterdays. Happiness and good days are key ingredients to longevity and well-being. How many times do you hear that idea tossed about? Two evenings ago riding back from the surfbreak, Playa Avellanas, my friend and I got into a bit of a heated conversation about aging and surfing and competitiveness and illness. He kept talking and I kept talking back. My voice kept getting louder and louder. I was working hard to get my point across. I have never bought into the widely accepted concept that illness is a part of the aging process. Forget it! Your beliefs are your strengths or weaknesses. Come to think of it, I never accepted the idea of plucking my eyebrows either. It just didn’t make sense, to stand in front of a mirror and inflict pain on myself. That being said, before I left the States a month ago, I saw Piper Austin on a local news show. She had just won the Girls~East Coast Champion Title. Not bad Piper! She was asked, what advice she would give to a surfer, who wanted to improve. Her immediate response was yoga. Cling to what makes sense. 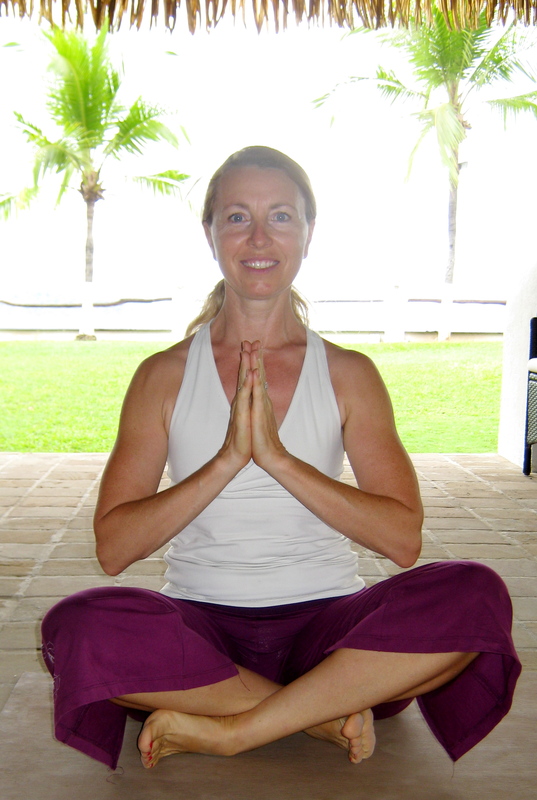 Yesterday, I started out my day with a sattva yoga class. 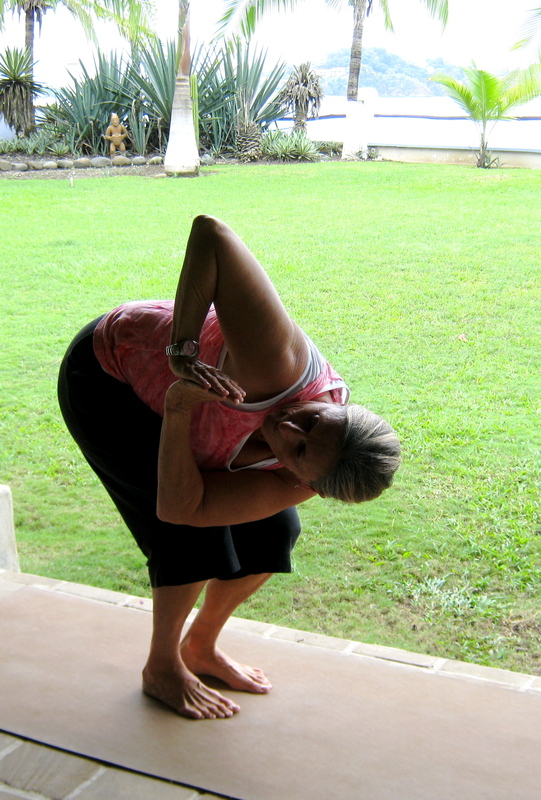 I know that as the years pass, if I don’t do something, I will continue to loose my flexibility. Everyday is a good day, to do something good for yourself! Later in the day, I was back at Playa Avellanas, catching waves. WARNING: do not believe these three downtrodden, mistaken myths; that you will become sick as you age, that surfing is only for the young and that you had to start surfing when you were a kid. Life is what you make it. Have a good day! Did I make myself clear? Posted on December 16, 2011 March 3, 2017 Categories December 2011Tags aging, East Coast Champion, happiness, illness, longevity, Piper Austin, Playa Avellanas, surf, surfing, well-being, yoga4 Comments on Creating good days!